A wild and wet late July evening saw a handful of West Kent CAMRA members braving the elements for a crawl around the pubs of Shoreham. 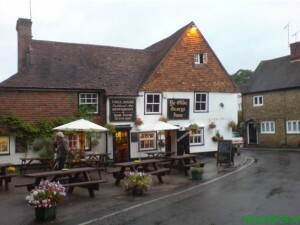 This pretty and attractive village is situated in the Darenth Valley, between Sevenoaks and Swanley, and despite its rather “well-heeled” nature, still manages to support four pubs. The Shoreham crawl is quite a regular feature on the branch social calendar, but as previous crawls have taken place earlier in the year this was the first time we have visited the village in daylight. Walking down from the station we passed Ye Olde George Inne, the first of Shoreham’s four pubs. The plan was to head for the furthest pub and then work our way back to the George. We would then be handily situated for the short walk back up the hill to the station, and the train home. Crossing over the fast-flowing Darenth, and passing both the Kings Arms and the Two Brewers, we made our way to the Crown, and stepped inside for a much needed drink. 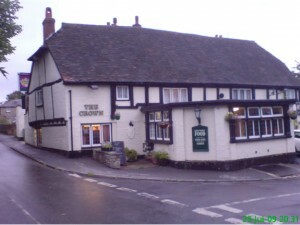 The Crown is a rambling old building, and is unusual in still having two bars. We chose the lower, and larger of these. Greene King Abbot and Westerham Summer Perle were the beers on offer. Most of us opted for the latter, finding it an ideal summer pint; the only thing missing was summer itself! From the Crown it was back to the Two Brewers. This pub, with its one large L-shaped bar, open-plan layout and red and gold wall-paper reminds me more of a restaurant than an actual pub. It was certainly quite busy with diners when we called in. Sheperd Neame Spitfire and Greene King IPA were the beers on tap. I opted for the IPA, not being a great fan of Shep’s these days. 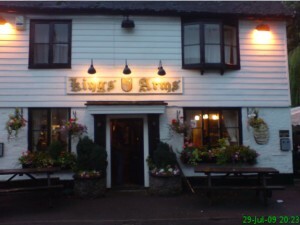 We then moved on to the Kings Arms; a smaller, and perhaps more intimate pub, which despite the internal wall having been removed, effectively still has two bars. 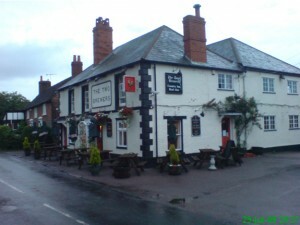 The pub dates back to the 16th Century, with a white weather boarded exterior. Harveys Best was the beer of choice here All too soon it was time to brave the rain and move on to the final pub on our crawl; the George. This pub had been closed on my previous two visits to Shoreham for reasons that are not altogether clear. Thankfully, the pub has recently changed hands and has been given a new lease of life. It now keeps regular hours, and what’s more, it offers meals plus a good range of beer. Most of us opted for the Batemans XB, a beer that is not often seen in this neck of the woods. Ye Olde George Inne lives up to its name, with low-beamed ceilings, and uneven floors. The manageress introduced us to the pub’s owners, who had happened to drop in that night. They also own the Fox & Hounds, tucked away up on the North Downs, at Romney Street. Unfortunately it was all too soon time to leave the George and walk back up the hill to catch the last train back to Sevenoaks and beyond. It had been a most enjoyable, but somewhat hectic tour of one of Kent’s prettiest villages.